For those of you who don't read my Facebook page, I wanted to let you know that my brand new diabetes book has finally launched. This is the first completely new health book I've written since 2012. It's 240 pages long in print and packed full of stuff I didn't have room for in Blood Sugar 101. 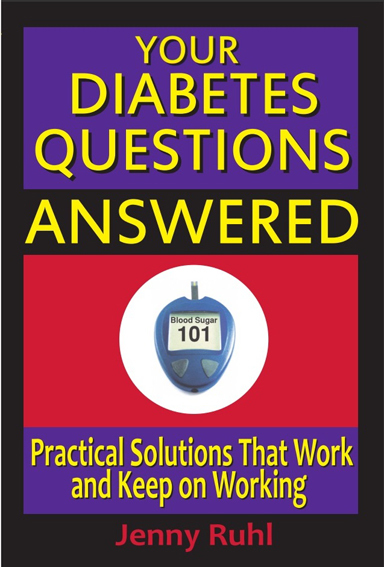 It's called Your Diabetes Questions Answered: Practical Solutions That Work and Keep On Working. This book is a problem solver. It uses an easy-to-read, informal Q&A format to answer over 200 questions of the sort people have been emailing me over the years since I first published Blood Sugar 101. If you've read Blood Sugar 101, some of this material you'll find here will review what you already know, but quite a bit of what you'll find here is new. You can download a sample or go to your favorite eBookstore to buy the paperback or eBook versions. If you find it helpful, do consider posting a review on the bookstore website where you bought it. That's the best way to raise the visibility of a new book nowadays so that other people who need it can discover it.